at Districts in Matrix History! 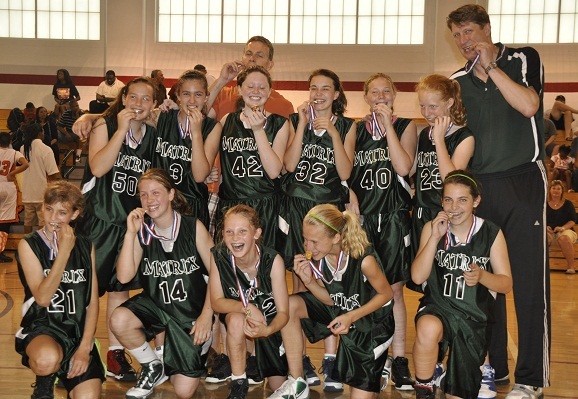 Congratulations to the Matrix 2017 Green team coached by Clay Buckley for winning the 6th Grade Division II Potomac Valley DQT championship on Sunday, May 22, 2011. This marks the first gold medal ever won by a Matrix team at Districts. The Matrix 2019 Black and 2016 Black teams also earned gold for the Matrix on the same day. It is only fitting that the first gold medal in Matrix history went to a Matrix Division II team. One of the key tenets of "The Matrix Way" is that we strongly support our Division II teams with excellent coaches and club support. In fact, both our 6th Grade Division II teams medaled and we were just 4 points away from an all-Matrix final! Coach Buckley's team has an excellent history with the Matrix, going back to when they were in 4th Grade and the defeated five Division I teams that season. They won the bronze medal as 5th Graders in Districts last season. The team will be attending Divison II Nationals in Kingsport, TN from July 3-8. Click here for a detailed write-up on the 2017 Green team undefeated run to gold in the DQT on the 2017 Green homepage. Go Matrix!!!!! Last Updated: May 22, 2011.